St James's Day is actually on July 25th, but we celebrate this day a few weeks earlier before people go away on holiday. St James’s Day is our Patronal Festival celebrating our patron saint, St James. Patron saints are saints who were chosen as special protectors or guardians over certain things like occupations, illnesses, churches, countries, causes, in fact, anything that is important to us. 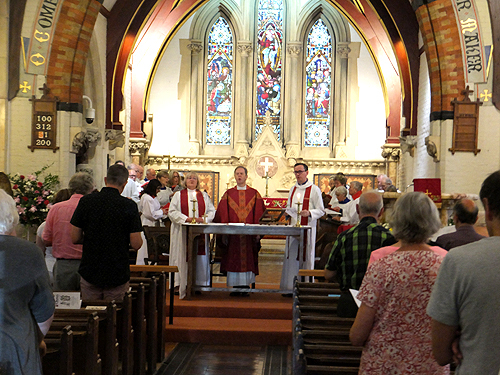 We have a service all together at 11.00, usually a Parish Communion often with a guest preacher. Our Sunday School, the Shell Seekers, take part in the service and the uniformed groups sometimes join in by carrying their flags in a colourful parade through the church. At Revd Winterburn's first St James's Day, in 2017, the formal was combined with the less formal with the organ playing, the choir singing an introit and anthem and the St James's Players accompanying the last two hymns, playing music during the giving of the communion and the exit music. The children enthusiastically joined in the hymns with bells and other instruments! After the service, every St James's Day, drinks are served in the vicarage garden and sometimes different activities are held while the usual family shared BBQ lunch is being prepared. 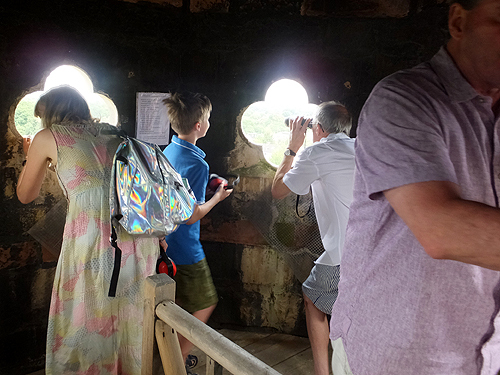 A churchyard trail has been popular lately and various activities also take place after the lunch, such as bell-ringing in the tower, climbing the spire and a bouncy castle or slide, badge-making, face painting and other activities for the children. There have been Parish Treasure Hunts, and 'Beating the Bounds' where parishoners (of all ages) took to their bikes (of all types) and rode around the boundary of the Parish of St James.